Do you love fried apples that you can often find at breakfast restaurants like Cracker Barrel? 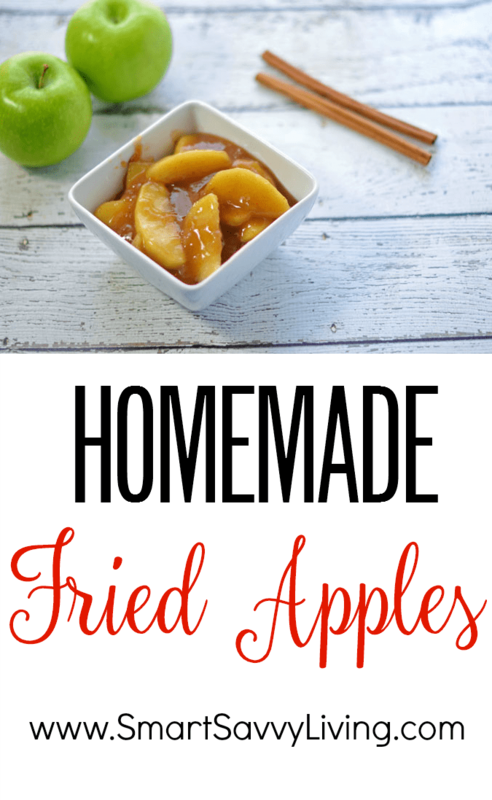 You’ll love that you can make them even more delicious at home with this homemade fried apples recipe! Having been raised in the south, I will admit I still love a good southern breakfast now and then. Especially during the cooler months, there’s just something warm, comforting, and hearty about a breakfast that has things like country fried steak with gravy, biscuits, scrambled eggs and hash browns. It’s not something I make very often for health reasons, but honestly also because it makes a ton of dirty dishes. While we’re lucky enough to have a dishwasher, I still like to complain about having to wash all those cast iron skillets I love so much by hand. So, every now and then we have that familiar hankering for a good southern breakfast on the weekend, even if it may be closer to lunch time by then. When I’m feeling lazy, we’ll head over to Cracker Barrel. While I’ve pretty much always liked any foods I’ve tried there, there’s one dish that I have to get every time I go there. Every single time, without fail, or I fear a kitten might die. The fried apples. 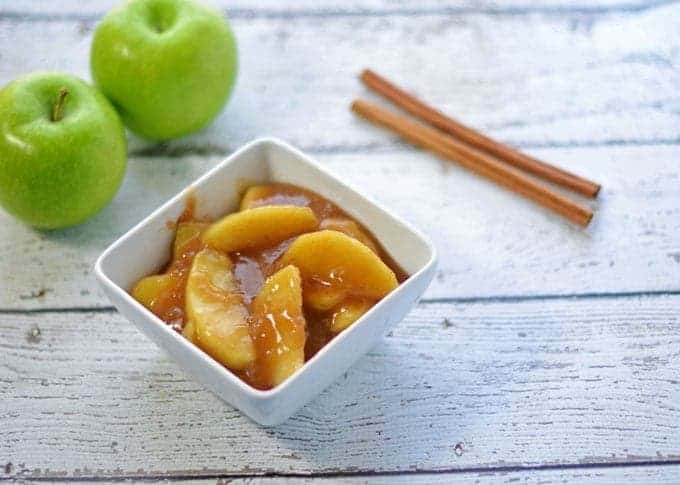 To me, they’re one of the best desserts turned side dishes with their just slightly crisp apple slices bathed in a lightly sweet and spicy in all the right ways sauce. Since it is at least fruit, I like to think it isn’t too terribly bad for us to eat on a more regular basis. Honestly, with the way I make the recipe, it really doesn’t have that much sugar in it. I especially can’t resist the temptation now that it’s apple season, so I wanted to try my hand at making our own. I do make a few changes from what I think Cracker Barrel does. First of all, Mr. Savvy prefers the apples to be peeled. I like them with the skin on, but since I kind of like him and stuff, I usually peel them. Secondly, I’m pretty sure that Cracker Barrel uses Golden Delicious apples, but we usually have Granny Smith apples on hand, so that’s what I use. They have a slightly tarter bite against the sweet sauce, which I actually like a bit more than what you get at Cracker Barrel. Otherwise, I find this homemade fried apples recipe to be very similar with texture and taste. These homemade fried apples are also great in a variety of ways. You can eat it with breakfast, at dinner as a side to pork, as dessert with a bit of whipped cream, an ice cream topping, or a topping for waffles and pancakes. The list goes on and on and I’m pretty sure you’ll like them so much you’ll be looking for excuses to make them again and again anyway. This section includes affiliate links for tried and true equipment I use in our kitchen. This means if you order a product through one of these links, we may earn a small commission fee from your purchase. Do you love fried apples that you can often find at breakfast restaurants like Cracker Barrel? You'll love that you can make them even more delicious at home with this homemade fried apples recipe! Core and peel apples, if desired. Slice apples in desired thickness. Thinner slices will cook faster. Pour cider or juice into a large skillet heating over medium heat. Arrange apples in cider in a single layer. This is important so they can cook evenly at the same time. You can cook them in batches if needed. Cook apples until just fork tender. Watch them carefully as you don't want to overcook them and they will continue to cook after removing them from the cider. Using a slotted spoon, transfer the cooked apples to a large bowl. I just use the serving bowl for one less dish. In a small bowl, thoroughly mix together cornstarch, sugar, cinnamon, cloves, nutmeg, and salt. Once mixed together, whisk in 1 - 2 ladles of warm cider mixture until everything has dissolved and no lumps are visible. Whisk mixture into remaining cider in the skillet over medium heat. Heat and whisk until sauce has thickened to your desired consistency (note it will thicken a bit as it cools). Pour sauce over apples and toss to coat evenly. Serve hot or let cool before serving. Leftovers should be stored covered in the refrigerator. 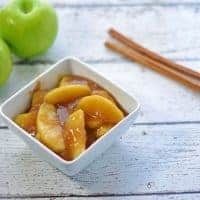 Feel free to change up the spices as you like, taking out any you don't care for or adding others that you enjoy with apples, such as ginger. « 5 Creative Ways to Gift Chocolate + Enter to Win 100 lbs of Chocolate! Have apples on hand but no apple cider. What could I use instead? Hey Linda, thanks for stopping by. You could use apple juice or just water instead. The spiced cider does add some extra flavor, so you may want to add an extra pinch of the spices.